Ornamental grasses are a great addition to any landscape. They add texture, color, form, and interest. These grasses need the same types of maintenance as other landscape plants (water, fertilizer, pruning, division), but generally require much less. As with all types of plants, consider the site conditions of your landscape, which include sun, shade, mature size (height and spread) for placement purposes, soil pH, soil moisture, and soil texture. Other considerations when selecting plant material include annual or perennial, evergreen or deciduous, warm or cool season, growth form (creeping or clumping), foliage color, time of flowering, winter characteristics, and invasive potential. The ornamental grasses below thrive in central Florida. Muhly grass, Muhlenbergia capillaris, a native plant, reaches a height of 3–4 feet and a spread of 2–3 feet. It prefers full sun, can tolerate extreme drought and flooding, has moderate salt tolerance, and works well in wetland sites and beachfront landscapes. Any type of soil texture is acceptable, from clay loam to sandy loam, from sand to sandy clay. Muhly grass has narrow foliage and produces pink/purple fall flowers. It is used as a border, as an accent, in mass plantings, and as cut flowers. Fakahatchee grass, Tripsacum dactyloides, another native, reaches a height and spread of 4–6 feet. It prefers full sun, does well in partial shade/partial sun, and tolerates flooding and standing water. Fakahatchee grass produces cream/yellow/orange/red flowers from spring through summer and is a larval food plant for the byssus skipper butterfly. 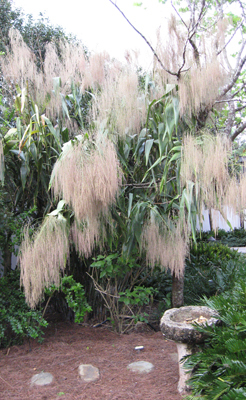 This ornamental grass also requires minimal maintenance, which consists of pruning once a year in late winter or early spring (February and March in central Florida) before you see new shoot growth. Purple fountain grass, Pennisetum setaceum ‘Rubrum’, can reach a height of 4-6 feet and spread of 2–4 feet and prefers full sun. This grass needs soil pH that is acidic to slightly alkaline, from 4.5–7.2. It has moderate drought tolerance and needs well-drained soil moisture. 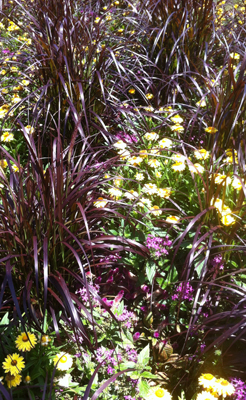 Purple fountain grass has narrow purple leaves with purple-pink or copper flowers in summer and fall. 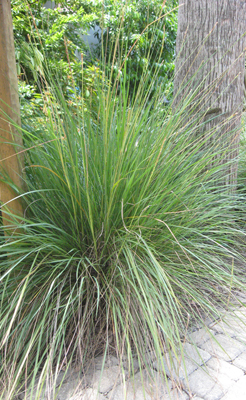 This is an excellent ornamental grass when used in mass plantings, in containers, or as an accent, border or cut flowers. It can reseed into surrounding areas, which could be a good or bad thing, depending on your location and preference. Tiger grass, Thysanolaena maxima, can reach a height and spread of 6–10 feet. It prefers partial sun/partial shade and is fast growing. Soil pH should be acidic to slightly alkaline, 4.5–7.2. Any type of soil texture is acceptable, from clay loam to sandy loam, from sand to sandy clay. Soil moisture should be well-drained to medium-drained. Tiger grass has medium drought and medium salt tolerance. This grass has a bamboo-like appearance with linear leaves and golden brown flowers in summer. It can be damaged by cold weather but will return in the spring. I planted three of the four ornamental grasses presented above around my pool enclosure because the hedge that existed was performing poorly. I’m very happy with the look of these grasses and the minimal maintenance requirements. All of the grasses in this article are easy to divide to share with your friends and neighbors, or to use to create more color in your own landscape. Once established, irrigation may not be needed at all. You can consider annual fertilization, but these plants generally obtain enough nutrients from the soil. You may want to submit a soil sample for pH testing, which is performed at many Extension offices for a minimal charge per sample. For more information on how to take a soil sample, please see the University of Florida publication, “Soil Sampling and Testing for the Home Landscape and Vegetable Garden,” by Rao S. Mylavarapu at edis.ifas.ufl.edu/ss494. For additional information on Florida-friendly ornamental grasses, please see “Considerations for Selection and Use of Ornamental Grasses” by Mack Thetford, edis.ifas.ufl.edu/ep233; “Muhlenbergia capillaris Muhly Grass” by Edward F. Gilman, edis.ifas.ufl.edu/fp415; and “Pennisetum setaceum ‘Rubrum’ Purple Fountain Grass” by Edward F. Gilman, edis.ifas.ufl.edu/fp464. As always, follow the landscape or architectural control procedures in your deed restrictions before making changes. For more information about the nine principles of the Florida-Friendly LandscapingTM Program or for assistance with gardening-related questions, contact your local University of Florida Extension county office and visit the University of Florida website at solutionsforyourlife.com. Remember to reuse, reduce, recycle, and repeat. Lynn Barber, Agent, University of Florida/IFAS Extension Hillsborough County, is responsible for educating residents on the nine principles of the Florida-Friendly LandscapingTM program. These principles include right plant right place, water efficiently, fertilize appropriately, mulch, attract wildlife, manage yard pests responsibly, recycle, reduce stormwater runoff, and protect the waterfront. 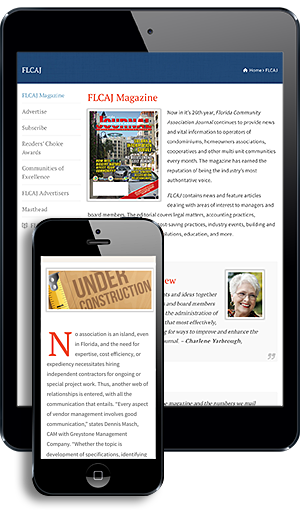 Barber is past president of the Florida Association of Natural Resource Extension Professionals and has received numerous awards for programming, publications, and television and radio segments. As a Master Gardener, she has given back thousands of hours in environmental horticulture education to the community.